Introduction: In a previous article, we shared our thoughts with you on the Lucky Craft LV-500 MAX - a lipless crank that packs a lot of punch. Today, we bring you another intriguing bait from one of Lucky Craft's staunchest competitors - Megabass. Pull up alongside as we share with you, our season long story on the Megabass Vibration-X Ultra. Impressions: Just about every lipless crank out there shares one thing in common - a flattened surface at the top of the head that serves as a plain of resistance when the bait is coming through the water. This bit of resistance is responsible for the tight wobbling or vibrating action of the lipless crank as it is being retrieved. Imagine our curiosity then, when we held our test baits for the first time and noticed a convex surface at the head of these lures. The subtle differences on this bait do not end there. Looking closely, one notices the body has its own unique touches. The Vibration-X actually has a belly! Not only that, but its gill plates are very pronounced as is its mouth which has a lips resembling that of a carp. 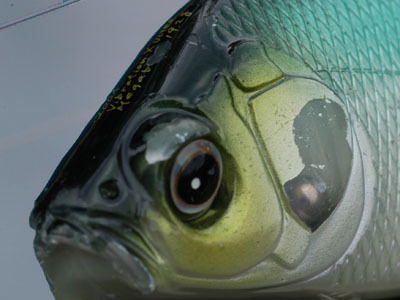 The eyes of the Vibration-X, as with all Megabass Lures, protrude from the head in a very life-like manner as well. 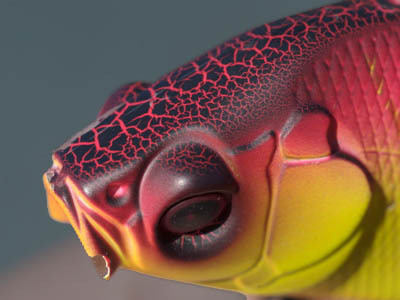 Not much is lost in the detailing of these lures. The Field Tests: Off to the California Delta and many of the other bass waters in Northern California we took with our Vibration X tied to 12lb Yozuri Hybrid, spooled on a Shimano Conquest 51, mounted on a G.Loomis MBR843C GLX. 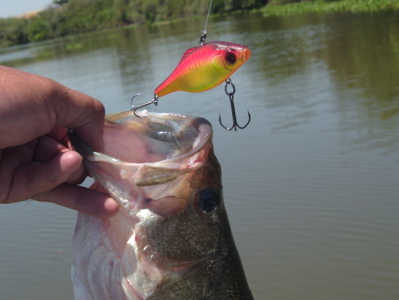 We fished this lure from mid-Spring through early Fall and here's what we thought. Detailing on the head of the Vibration-X is exquisite. 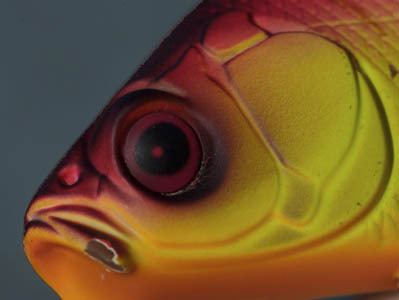 Everything from the pronounced gill plates to the downward gazing eyes to the fish's nostrils to its carp-like lips. Presentation: We all know casting with lipless cranks is hardly an issue. 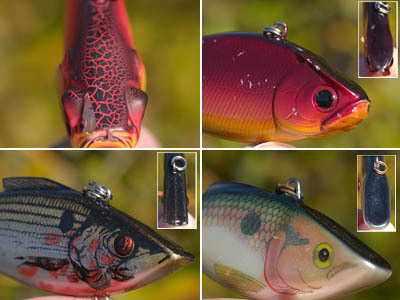 In fact, anyone looking to learn how to use a baitcaster should tie on a lipless crank (provided you're on the water!) and cast away! 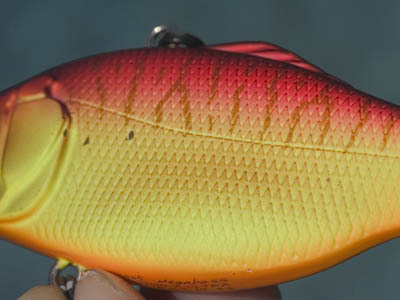 These baits travel like projectiles through the air and the Vibration X is no exception. Where and how we chose to fish this lure, then, might be of more interest. Our primary target, along the California Delta, was the pervasive weeds. We cast and retrieved this bait along the weedlines, through the weed patches, and over, along the top of some of the weed clumps. The Vibration X proved equally effective burning through the water past this structure. What took a little practice was pulling this bait over along the top of the weeds and not because the bait isn't capable, but getting it up to the surface after a cast can be a challenge thanks to its rapid rate of descent once it touches the water. To compensate, what we ended up doing was to pitch this lure out on tight line and begin our retrieve the second the bait hit the water. What we were rewarded with, as our bait ticked the top of the weeds was a lot of fish catching action! Action: Whether retrieved at a slow pull or rapid burn, our Vibration X lipless cranks demonstrated a very tight wobble typical of other baits in this same classification. What's interesting is, unlike your typical lipless crank, the Vibration X features a natural, rounded head instead of a flat surface. 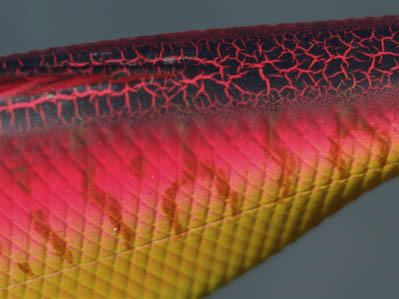 Other baits rely on this area to give them their unique actions - not the Vibration X. Instead, Megabass's lipless crank achieves its tight wobbling action through the subtle curvatures of the baits body and through careful balancing of the internal brass rattles. Thanks to the well balanced nature of this bait, it also sinks in the water column in a very realistic, head down fashion. In fact, many times, after casting the bait in our test pool and letting it sink, we could see the lure standing on the bottom balancing on the bait's would be lips! Durability: If there's one disappointing factor we found in our Vibration X lures it was in the durability of the finish. A number of our test baits demonstrated premature wear with paint chipping in and around the head. Could this be the result of the more natural shape of this lure's head or a problem with the bonding process during finishing? We sent our baits into Megabass USA for evaluation and they gladly sent us back replacements to re-test. Unfortunately, we encountered similar results. Effectiveness: Despite the problems encountered with premature wear on our baits, we found the Vibration X to be quite an effective lure in and around any type of weeds. The smaller sized rear treble was effective at reducing hangups while still large enough and free enough to snare those short strikers. In areas of more sparse cover and areas occupied by a lot of rocks, we preferred to make use of other baits like our Lv-500 MAX. The Vibration X just wasn't as effective for us in open water situations. Features: Aside from the plethora of subtle design features already discussed in this intriguing lure, the Vibration X features Megabass's exclusively designed Katsuage treble hooks whose hook points are designed with out-facing barbs. We've yet to conduct an analysis on this particular hook design to discern whether it offers any real advantages or disadvantages to the angler but we certainly appreciate the effort and forward thinking mentality that emanates from the offices of Megabass. 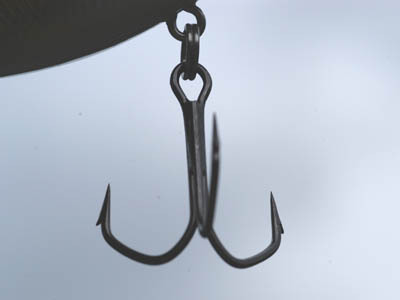 These hooks are very sharp and durable. We barely hooked this feisty bass retrieving our Vibration-X over the top of some weeds in the California Delta. Conclusion: For once a Megabass product that does not exude perfection. What is the world coming to? Though our Vibration X receives a good grade for design and reasonable marks for performance, there's no getting around the puzzling premature wear on the finish of these lures. Perhaps the analysis of our test baits back at Megabass USA or Megabass Japan will eventually result in an explanation but perhaps not. 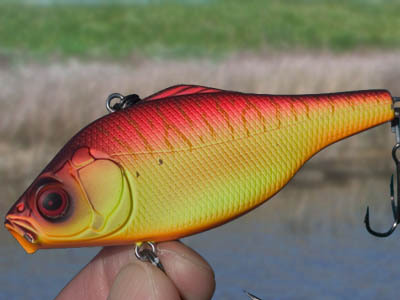 We've certainly come to expect more from this tackle manufacturer and together with the steep price tag on these lures, I'm not so sure the Vibration-X Ultra is quite ready for prime time. Certainly, this bait has been in existence for some time, so maybe we're being too harsh. One thing is for certain, it is an effective lure when worked in the ways described above. Will we continue to use these baits? Probably. Will we be replacing any of our LV-500 MAX's with these baits? Probably not.